Update your Chester Chest and your entire training program economically and easily just by replacing the detachable arm with this advanced version. Features a dual lumen 5 FR PICC (Peripherally Inserted Central Catheter) exiting the basilic vein from the inner biceps area, which is the current preferred placement. The basilic vein is slightly raised for easy identification. 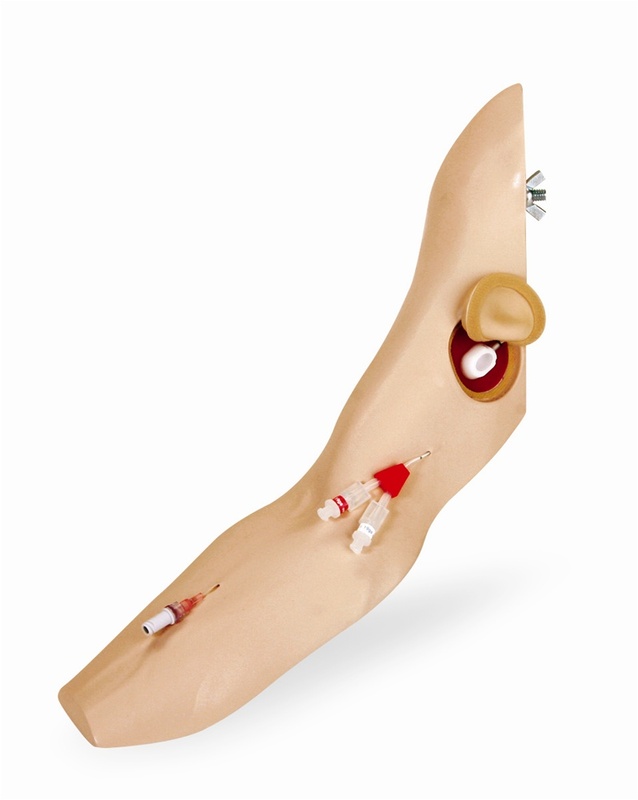 Proximal to the PICC is a recessed area for the placement and suturing of a peripheral port (port is shown, but not included, SU-SB45081 sold separately). The peripheral port, when attached, will "float" on the underlying tissue like material. The recessed area is covered with a removable flap that has the feel of human tissue which, when placed over the optional port, provides the realistic practice of palpating and accessing. An additional feature of the arm is a pre-positioned IV catheter in the forearm. The improved arm provides a greater degree of rotation and extension for easier access to the PICC and recessed area for the peripheral port.